In the past few weeks, Boko Haram killed hundreds of Nigerian soldiers, which is more than it has ever done since the beginning of the insurgency. Yet the federal government has not considered it fitting to acknowledge this tragedy, much less condole with the families of the deceased soldiers. In fact, on the day the fallen soldiers were given an undignified mass burial, President Buhari met with senators in the Presidential Villa to save his increasingly threatened second-term ambition. To this day, he has never said a word about this horrible tragedy even though he is the Commander-in-Chief of the Armed Forces. Several reports have also surfaced that the soldiers fighting on the frontlines are owed several months’ worth of allowances and that many of them are now practically beggars. TheCable’s investigations show that the military men fighting Boko Haram are practically being forced to commit suicide because they are severely ill equipped. In other words, there is no difference between President Goodluck Jonathan and President Muhammadu Buhari in the prosecution of the war against Boko Haram. Well, the only difference is that the Buhari regime has been more effective in muzzling the press and in intimidating private individuals in the northeast into not disclosing the true situation of the Boko Haram insurgency in the region. What is now coming to light in spite of government’s studious efforts to suppress it supports my column of February 24, 2018 titled “Bursting the Myth of Buhari’s Boko Haram ‘Success’.” Almost everything I said in that column is bubbling to the surface now. The sanguinary in-fighting among Boko Haram members, which I said was the biggest reason for the lull in its attacks, is now well-known. The Daily Trust of September 14 reported that fighters formerly loyal to Mamman Nur, a factional leader of Boko Haram, killed him in August. A false narrative that several people cherish about the Buhari government is the notion that its singular greatest achievement is its success in containing, downgrading, or defeating Boko Haram. It’s like a consolation prize to compensate for the government’s abject failure in every index of governance. I recognize that taking away the consolation prize of Buhari’s Boko Haram success narrative would cause psychic and cognitive dislocation in many people who will ignore the substance of my argument and launch petulantly juvenile ad hominem attacks on me, but I’m already used to that. But the question I always ask people who talk of the Buhari administration’s “success” in “downgrading” or “technically defeating” Boko Haram (whatever in the world that means) is: what exactly has Buhari done that hasn’t been done by his predecessor to bring about his so-called success? The only intelligent answer I’ve received is that he ordered the relocation of the command center for Nigeria's military operation against Boko Haram to Maiduguri. Well, that’s commendable, but it conceals the unchanged, sordid underbelly of military authorities. For instance, the military is still severely underfunded and ill-equipped. Soldiers on the front lines are still owed backlogs of allowances; several of them still starve and survive on the goodwill of do-gooders. Two videos of the heartrending conditions of our military men fighting Haram went viral sometime ago, and military authorities were both embarrassed and caught flatfooted. I periodically speak with my relatives and friends in the military fighting Boko Haram, and they say little or nothing has changed, except that propaganda and media management have become more effective. The fat cats in the military still exploit and feed fat on the misery of the foot soldiers. I published letters in 2014 from Borno readers of my column that said the people would rather live with Boko Haram than cooperate with the military because they believed the military was part of a grand plot to annihilate them. The military was so frustrated that it almost wiped out the entire village of Baga in April 2013 when residents provided cover for Boko Haram insurgents who escaped into the area. I wrote to condemn the military at the time. All this changed because the president is no longer a Christian from the south. Buhari isn’t just a northern Muslim; his mother is half Kanuri, and that’s why most (certainly not all) people from the region intentionally exaggerate the extent of safety and security in the region even when the facts give the lie to their claims. It's all ethnic solidarity. A Maiduguri person with a PhD actually once confided in me that he would never stop supporting Buhari and propagandizing on his behalf because of the Kanuri heritage he shares with him. Imagine what uneducated and barely educated people from the region think. 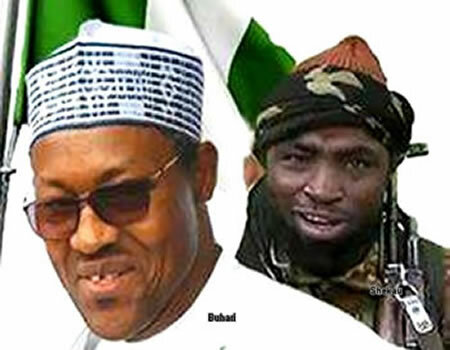 Because someone with some Kanuri blood in him is president, Boko Haram is no longer a plot to depopulate the northeast. No northern elder is pleading amnesty on the group’s behalf. The group is no longer fighting “for justice.” Killing them is no longer “injustice” to the “north.” And everything is now hunky-dory. Ethno-regional bigotry will be the death of Nigeria.